I’ve share with you some time ago (in this blogpost) my involvement in my friend’s documentary film on forge welding. I am really happy to report that the project was quite successful, and many professional and amateur blacksmiths and enthusiast of the craft have asked the film and the project to continue. That is how the idea of an instructional video on the subject of forge welding was born. As I was the voice for the original film, my friend asked me to help with the new documentary as well. 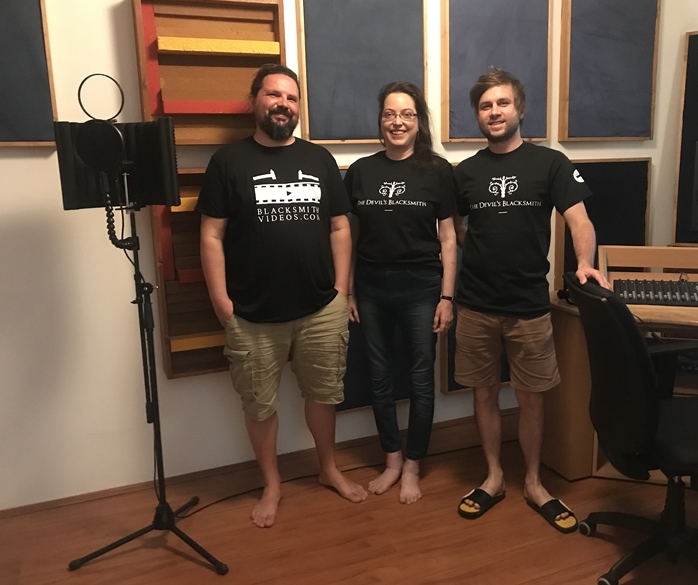 This time the recording took place at a professional studio with a professional sound engineer instead of our living room. It was strange to be there. Serious guy and an even more serious looking studio microphone and pop filter looking me straight in the eye. For a second I got dizzy and almost burst out singing Crazy in Love but lucky for the guys around me I quickly realized that I only sound like Beyonce in the shower. I found myself taking a sip of water and taking my sandals off. I started getting more and more relaxed. I found the voice and style I used for the previous narration and just let things roll. The recording turned out quite good. It seems I still have some problem with my p-s, or rather as it turns out, the software has some problems with my p-s. But it is not something that cannot be worked around. So what is next? Oh, things are going to be busy! In June I am going to go to the BathIron festival in Bath, England, where I will be taking part in the screening of the original documentary and the Q&A that follows it. I am super excited! Hope to see you there!